So I like writing Expression tree API magic, but I am mortal and don’t find it that easy to do, and it normally takes me a while to do this. So I am up for any help that I can get. 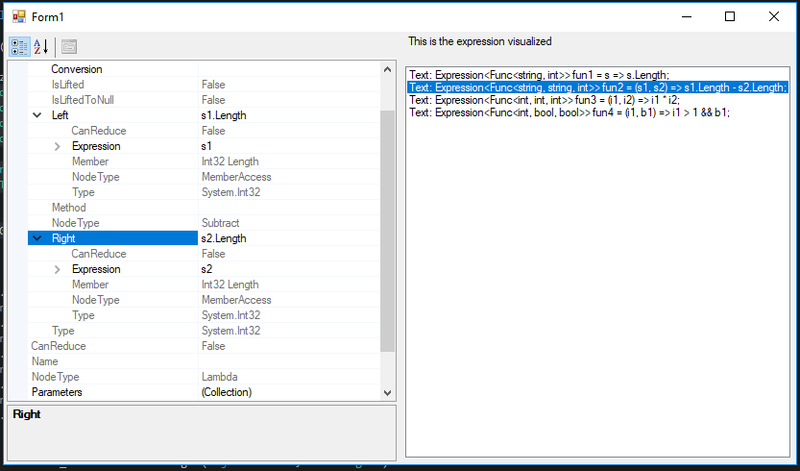 Some of you may remember a rather handy ExpressionTree debugger visualizer that allowed the visualization of expressions. Basically it was extremely handy and a great way of getting to know the Expression API a bit better. Unfortunately this was a VS2008 sample, and it does not seem to come with VS2010. I had not been missing it as I have not been doing much with Expressions, that is until the other day, and I really started to miss it. So I set about trying to get it to work. Today I wrote a small utility class that allows any List<T> to be exported to a CSV string or a CSV file using a nice Fluent interface. The other day I was messing around with an idea I had where I had a object graph of related objects which looked something like this (where each object was an INotifyPropertyChanged object). And I thought wouldnâ€™t it be nice if I could observer changed from any of those object conveniently, and without the need to hook/unhook when new object were introduced into the object graph. So I had a think and came up with a bunch of classes that do allow me to observe changes in a chain of objects, and do so in a kind of fault tolerant manner, where replacement objects could be brought into the chain, without any adverse affect to the INPC listeners.